Provides an integrated clearly-mapped source for nationwide STATS19 collision data, Cycle theft reports, planning applications. 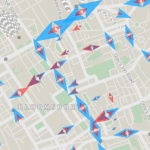 DfT Traffic counts visualised in a novel way, and more including the Strava heat map of cycle journeys and information about the routes planned using the Cyclestreets Journey Planner. Use the tick boxes on the right of the map to select the data layers you want. You can also filter the data by years and categories. Here is the original report with illustrations of the collision categories’ meanings. A Google Fusion Table. We’re grateful to Sam Longman, formerly of Camden Council for producing and making this data available. Provides street-level traffic data for every junction-to-junction link on the ‘A’ road and motorway network in Great Britain. This is a Google Fusion table created by Alex Ingram. It has several tabs, some of which are displayed as browsable interactive maps. A click on a count point reveals the data for that point as a table for several years and vehicle types + PCUs. This map has markers at the points in Camden where the Department for Transport makes a traffic count each year. Click on a marker to see a table listing the count figures at that point. Some ‘Passenger Car Units’ (PCU) figures derived from the raw counts are also included. Made with Google ‘Classic’ maps. Created by Alex Ingram. 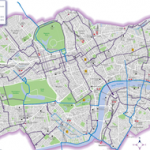 London Cycling Census Map. TfL Traffic Census April 2013. Created by Oliver O’Brien, UCL Geography, from TfL survey data. More info here. This impressive project draws on Strava’s huge dataset of rides logged by Strava users. You might wonder whether that has anything to do with utility cycling. In Strava’s FAQ they claim that nearly half of rides logged in ‘metropolitan areas’ are commuting rides. 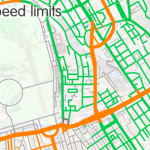 Of course even if that is true for the London section we can’t assume that it represents desirable routes used by a representative cross-section of people on bikes (and Strava don’t claim it does). But it does illustrate demand in a somewhat skewed way. Access to this public heatmap is free. It is complemented by a paid for service to access more detailed local Strava data. 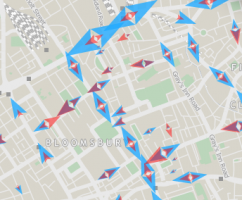 Another interesting Strava spin-off is Strava Routes, a tool for constructing routes based on the popularity of the roads with Strava users. The best route finder! This is the web interface. Note that the CycleStreets routing engine is also in iPhone and Android apps of the same name and is embedded in several others including BikeHub and CityMapper. 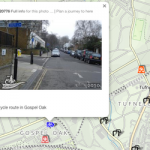 A huge collection of geographically-located photos made by cycle campaigners and other cyclists to illustrate infrastructure features and problems. Open Cycle Map is an extremely useful derivative of the well-known radically-disruptive Open Street Map project. 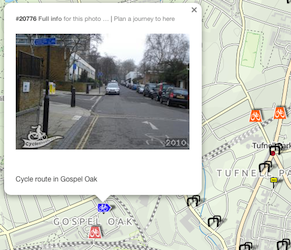 Open Cycle Map is a world-wide map rendering that shows signed cycle routes (e.g. 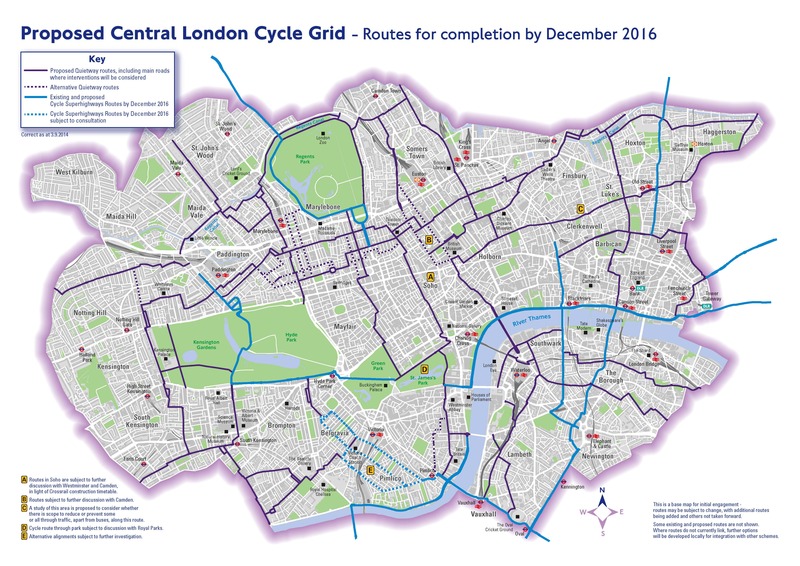 in London, all the LCN and NCN routes, with numbers). It has several additional layers. 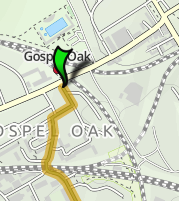 The Transport and Dark Transport layers are useful for cycle campaigners since the show all of the bus routes, with route numbers in the higher zoom levels. 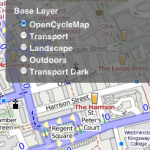 To access them, use the menu that drops from the layers icon at the top-right of the map. 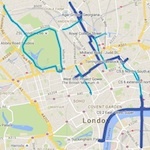 Andy Allan’s OSM-based Global Public Transport map can be used to check London bus routes and many other things. Matthew Somerville’s Live London Bus Map shows the real-time locations of the buses on any London bus route. He has also produced an interesting Live London Tube Map. Both maps use TfL data feeds. THE GAZETTE lists proposed and made Traffic Management Orders (TMOs). These are the legal orders that support features such as banned turns, parking restrictions and mandatory cycle lanes. Any permanent TMO must be subject to consultation, giving cycling campaigners the opportunity to comment on features such as banned turns where an exemption for cyclists could have been included. I use the website by clicking on ‘All notices’, then clicking the arrow to expand ‘Environment & infrastructure’ and clicking on ‘Roads & highways’, then clicking the arrow to expand ‘Location’ and clicking on the relevant local authority, then clicking ‘Update results’. Gives access to the borough-level and ward-level data on local issues (‘Asks’) and sign-up status of each ward counsellor. 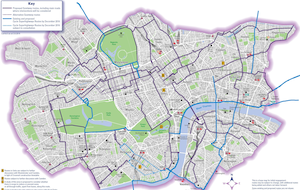 A multi-layer map made for the LCC’s 2014 ‘#Space4Cycling’ campaign. Several of the layers contain information that should be generally useful. Select the layers you want to view. (Those labelled in brown below are specific to the LCC’s 2014 ‘#Space4Cycling” campaign). 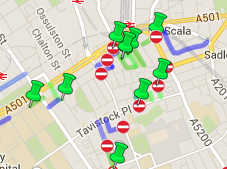 Schools & travel modes (2011): Schools and Colleges in Camden – clickable markers showing details of Camden schools and colleges with travel modes used by their pupils. Data is from a 2011 survey. Travel mode data is based on informal surveys of pupils and none is available for private schools and colleges. KSI Collisions 1994-2012: Locations and details of 16 fatal and 481 serious-injury collisions involving cyclists in Camden in this period. Space for Cycling Survey Results: Survey responses from 320 LCC members showing their individual ‘Asks’ in Camden (each with a clickable marker). Ask Summaries: 37 entries derived from the survey results as a first step towards identifying a single ‘Ask’ for each ward – to be put to all of the candidates by LCC members in those wards. Final Asks: This layer was never completed but the Asks finally selected can be found on this page on the LCC website. Made by George Coulouris with Google Maps Engine Pro, using data provided by Alex Ingram. Here is a page with details on this map’s construction and use. for making available much of the data used to build this map. 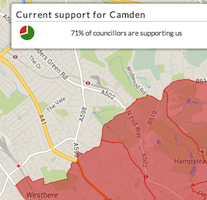 An interactive map showing progress with the network of protected cycling routes in Camden. The bulk of these routes comprise wide segregated tracks and protected junctions. Further routes awaiting approval or construction and others under discussion can be viewed. 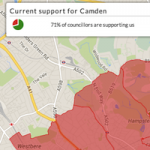 An ongoing record of issues raised by members that have been put to Camden, showing current status and successes. See legend for symbol explanation. Showing routes scheduled for completion by 2016. (map date: 2014). This is a really good report from TfL that debunks many of the myths about cars and shopping etc. LCC’s 2014 London Elections Campaign POLICY THEMES – a digested summary of the set of six policy themes formulated by the LCC Policy Forum (2014). This page was created by George Coulouris. Comments and suggestions for additions are welcome. Please send email to George Coulouris. Some updates 14 January 2019.